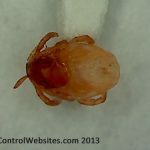 (Ixodes scapularis) The blacklegged tick is named for its dark legs, which are a contrast to its pale body. Blacklegged ticks are sometimes called deer ticks. (Dermatophagoides farinae) House dust mites have received much attention in the early 1990s and again recently. 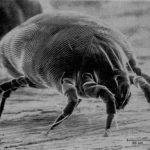 The house dust mite is nearly impossible to see without magnification and is named for the fact that they feed on dead skin shed by humans as well as other protein materials.